Microsoft has posted a new video, which showcases the new Xbox Store that comes with the New Xbox One Experience on November 12. Microsoft posted the new video on their official Xbox Wire. 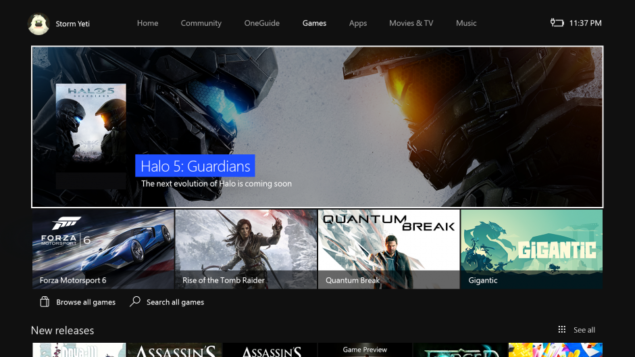 According Microsoft, the new Xbox Store, is much faster and easier to navigate. The new Store menu for each section is streamlined, allowing players to get to add-on content quickly, plus redeem any codes players may have. The New Xbox One Experience, is part of the Microsoft’s big November update for the Xbox One. The update is currently only available for those participating in Microsoft’s preview program, but will be made available for the public on November 12. “The New Xbox One Experience will be powered by Windows 10, elevating the gaming experience on Xbox One. Integrating the speed of Windows 10, the New Xbox One Experience will get you to popular gaming features up to 50 percent faster”, said Ybarra on the Xbox Wire Website. Early speed comparisons however, show a speed increase of more than 50% on most parts. The November update also marks the launch of backwards compatibility for the Xbox One. At launch players will be able to play over 100 Xbox 360 games on Xbox One with hundreds more in the months to come. The full list of games that will be available this month, will be made available on November 9.